Have a project you want to make a reality? Welcome to AIDC’s non-fiction XR marketplace. XR is the umbrella category that covers all the various forms of computer-altered reality, including; Augmented Reality (AR), Mixed Reality (MR), and Virtual Reality (VR). This highly-competitive speed-pitching event is a marketplace like never before. Now in its third year, Meet Your Maker is designed for non-fiction creators working in the XR sector to make meaningful connections with funders, festivals, exhibitors and buyers from around Australia. Dedicated to creating new pathways to financing and exhibition potential for non-fiction projects in the XR market, this is an event no creator can afford to miss! Ten projects will be selected to pitch to Decision Makers with the aim of forging relationships, storytelling ideas and real business outcomes that can advance projects and create opportunities. Submitting is free, however successful applicants will be expected to purchase a $250 (ex GST) registration for the day, and must be able to attend the pitch at their own expense, which will take place in Melbourne on Sunday 3 March, 2019. 2019 Decision Makers to be announced soon! 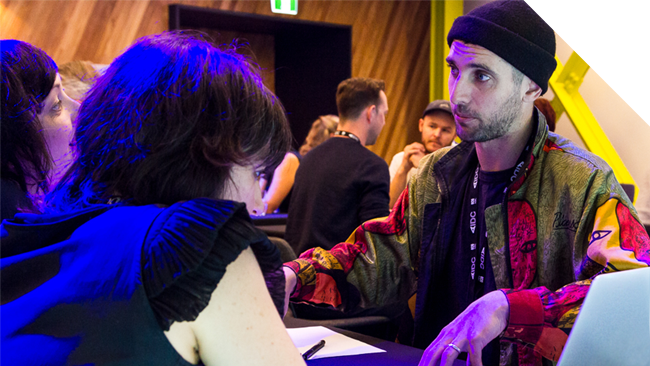 Applications for AIDC 2019’s Meet Your Maker: XR Marketplace are now closed. Projects must have a non-fiction element to be considered. Projects must be based in Australia, or have at least one Australian Key Creative. AIDC strongly encourages early-career, Culturally and Linguistically Diverse (CALD) and Indigenous practitioners to apply. The pitch must be nonfiction or include a nonfiction element, or the project will not be considered. Successful applicants will purchase a day-pass registration at $275 (incl. GST) providing them access to AIDC on Sunday 3 March 2019 by the allocated date or run the risk of losing their spot in the marketplace. The applicant acknowledges that whilst every endeavour will be taken to create a meaningful meetings for the applicant’s project, AIDC cannot guarantee that the project will be successful in attracting interested Decision Makers. AIDC shall use its best endeavours to treat all submissions confidentially however projects will be made available to Decision Makers participating in the Meet Your Maker XR Marketplace. There is a chance that a number of ideas submitted as part of Meet Your Maker XR Marketplace – including the applicant’s – may contain subject matter, themes, activity, characters and other material that is similar to other projects submitted to AIDC. The applicant acknowledges that AIDC is not liable in the event that the project submitted by the applicant is in any way similar to a project selected by AIDC now or in the future. By submitting your application, you hereby warrant that all information submitted by you is true, current and complete. AIDC reserves the right to verify the eligibility of all entrants.